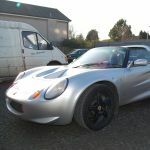 Been a long time on here...my old elise s1 has weathered 2 decades superbly and I apologise if this has been covered, (almost defo), however this driving me nutz...not the first time hahaha Basically the elise s1 cobra 6019hf alarm does not arm or disarm/immobilise...no fuel pump priming or any crank. Full Battery, checked fuses, connections, new batteries in 2 fobs, the Stick never worked...All I get is a beep beep for few secs n that's it...not even an alarm light n dash. I've tried the Inertia Switch back of engine...it's almost like it's just given up...bit like me lol..my question is am I missing something? I've located the cobra immobiliser at back under luggage lining...however can't see a way to bypass it? Any advise or help greatly appreciated;-) pics to follow...anyone tried the bypass from eliseparts? Looks like a total fkn mare!! Hahaha not sure if just something just simple...pics to follow, if I can figure upload lol. Cheers guys & gals. I had this, turned out that the immobilizer had given up the ghost. I ended up with the car going to Craig on a yellow taxi with the option of permanent bypass or a new alarm. I opted for a new alarm. If you're not living on the edge you're wasting too much space! I had this fitted as the original alarm is obsolete. Craig at CMC sorted mine out a few years back. Robin also a useful oracle on this I think. The easiest thing to actually do is buy and test the immobiliser bypass plug. Even if you end up not using it. It's simple to fit - drill out the rivets that hold the plastic cover over the immobiliser relay in the boot, pull the plug out (white plug, lots of black wires), plug the bypass in, see if it starts. If it does start then the immobiliser relay is knackered. I would leave the bypass as the permanent solution to that as there are two additional immobiliser mechanisms in place besides the one you just bypassed. If it doesn't start there are then two options depending on what does actually happen. (1) If fuel pump runs, engine cranks and engine catches but won't run then then either the immobiliser code is out of sync with the ECU (unlikely/impossible if the ECU and immobiliser have never been removed from the car) or the wire that carries the unlock code from immobiliser to ECU is broken. (2) If fuel pump doesn't prime and/or engine doesn't crank then you might have a fault with the MFRU or very close related issue (water in MFRU will prevent both the main relay and the fuel pump relay from engaging in some cases). It won't be the inertia switch as that wouldn't stop the engine cranking, just the fuel pump from running. Thanks all for your help....I've had this problem before over last 10 years off an on. It's always sorted itself somehow...like a ghost n the machine lol I've noticed over that time the alarm speaker makes strange noises and I wonder if it could be the ni-cad backup batteries are gone...?? Not sure that would affect the alarm system though...as I have no money, I think if I can't sort it with an immobiliser bypass is the best option for me...Eliseparts says it's a connector under some black cover near ECU...now I can see the ecu and cobra immobiliser close.by ...but what plastics cover lol . I've asked Eliseparts but if Anyone has experience off this please please share.. many thanks. Thanks Robin, very helpful ...is there a pic of plastic cover cover over the immobiliser relay per chance..or guide from where the ecu is n boot (back left corner under luggage lining)....wouldnt want to drill out wrong rivets lol any help appreciated. The siren and the immobiliser are separate. Worth looking at the nicads regardless as they are probably shot and will destroy the siren. Poor design as they are above the PCB and drip acid onto the gubbins. Thanks Stephen, great idea pal...might aswell swap em out while I am at it...save the siren. Cheers. If you're on a budget you can make your own immobiliser bypass out of two bits of single-core earth wire out of a bit of old mains cable. You need to poke the wires into the plug that you remove from the immobiliser relay. https://www.eliseparts.com/products/sho ... er-bypass/ worth a try. Hi, it's Pedro had to re-register. Thanks for all tips...Robin, I tried homemade bypass and sure nuff it cranked but no start...sure it's fuel pump connection. After cpl turns it makes a clicking noise. On further investigation I've found the pin n ecu connector has like an old broken wire...thing is I can't see the other end on ecu harness?? Is it an earthing maybe?? Also corresponding pin 5 I think, wire was worn to wire like a mouse has chewed n it hahaha...I guess that's th problem...connection missing to connector pin on ecu connector. Now...the question is..how do I sort that lol am no going to have to find where that cable led.. Otherwise I reckon your bypass works spot on. Again many thanks. If I could get a hold of the ECU connector for immobiliser, the white block, I could rewire it...looks like 8 black wires...need to colour code them and no sure about connecting with 5A connector block...but as am skint would save loadsa coin, as an ecu look, assuming I can get one is well pricey...like from ridiculous to crazy hahaha and I don't fancy wiring the whole loom...Any ideas guys?? A spare connector off a knacked ecu maybe...just cut cables back leaving as much length as possible...that way I'll have some room to connect new block to existing wiring just the immobiliser white block as in Robins diagram. Many thanks. Bit more info the ecu original mems 1.9 with 12 pin connector and it's pin 6 that has the burst cable...as I said afore tho it doesn't appear to be from the ecu loom, still think maybe an earth?? Still living in hope hahaha hope your all well enjoying the weather.